Dates. Yes, dates. Not the thing where people go out and have to have dinner while they talk about the weather, nor a date on a calender, i’m talking about the little fruits. I am fascinated by all the amazing recipes you can make with these little guys! When i was younger (even though i’m still young), my mom and i would make crispy date nut balls every Christmas and we called them “snowball cookies.” Now that i’m on the GAPS diet, i make my coconut snowballs instead. Anyway, I’ve had a brown paper bag of dates just sitting in my pantry for a while now. I re-discovered them today while looking for a snack… good thing dried dates don’t go bad for awhile. 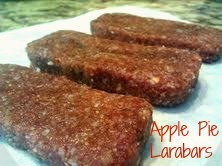 When I was searching online for some good date recipes, i came across the ever-amazing larabars (a favorite of mine before i became allergic to nuts). 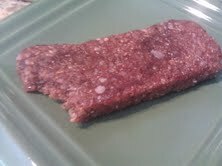 After one bite of my homemade larabar, i became convinced that dates are the best thing that i have ever discover in my pantry! 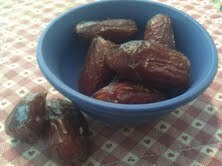 And dates are super healthy! If you like this recipe please suggest it to others and feel free to leave me a comment, thank you! In a food processor or magic bullet, process the dates. You can add in a bit of the coconut oil in this step if you need to. 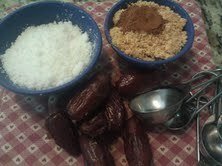 Once the dates are finely ground and sticky, add in the other ingredients and continue to blend. Remove from food processor when the ingredients are well blended and roll the “dough” into 3 evenly sized balls and shape into larabars. Enjoy as a snack or store in the fridge for another time. The best thing about these bars (in my opinion) is that they are super quick and easy to pack for school!